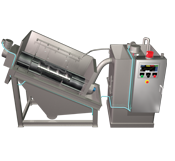 PWTech Volute Thickener: Automated sludge wasting from biological processes and thickening of dilute sludges for more cost-effective storage, dewatering, or transport. With a free, no-commitment demonstration at your facility. and we'll arrange for one of our demonstration units to be dispatched to your site. Or give us a call at 410-238-7977. Copyright © 2014, Process Wastewater Technologies LLC. All rights reserved. and thickening prior to storage, digestion, further dewatering, or transport, giving a solids output from 3% to 12%. The unit can be completely automated, uses very little power, and can be run over 30,000 hours between overhauls. Dilute sludge is dosed with polymer as it enters a flocculation tank. The sludge is gently mixed in the tank, separating into discrete agglomerations of solids (flocs) and free water, and then overflows into the thickening drums. Free water is discharged through the gaps in the thickening drum while solids are conveyed along the length of the drum and discharged at the opposite end. While both drums are the same size, the drum of the Volute Thickener is made entirely with plastic rings with a constant gap between the moving and fixed rings. The screw is a constant pitch, and there is no end plate. The drum's motor is less highly geared to allow for greater drum speeds. In addition, the piping connections are larger and the flocculation tank is larger to accommodate higher flows. Flows of up to 400 GPM can be dewatered with a single unit. PWTech offers the Volute Thickener as a complete package, including polymer system, feed pump (if required), flocculation tank, and controls. Several models are available. Contact PWTech engineers for help with system design. Copyright © 2008-2018. Process Wastewater Technologies LLC. All rights reserved.